Despite the apparent advantages of the internet, there is little debate that it facilitates intellectual property infringements, including infringements of trade mark rights. Infringers not only remain hidden by the anonymity the internet provides, but also take advantage of its increasing reach and the associated challenges with regard to cross-border enforcement of rights. These factors, among others, have rendered the internet a growing source of counterfeit and other infringing products. It has, therefore, become necessary for right holders to shift their focus from individual infringers to internet intermediaries, such as Internet Service Providers (ISPs), hosts and navigation providers that are responsible in numerous ways for making content promoting infringements available to internet users. 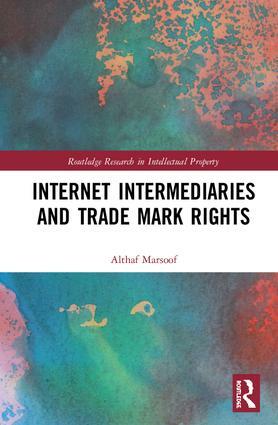 In light of these developments, this book conducts a comprehensive analysis of the liability of such intermediaries for trade mark infringements and considers the associated issues and challenges in the diverging approaches under which liability may be imposed. At present, however, neither UK trade mark law nor English common law principles relating to accessorial liability provide a basis to hold internet intermediaries liable for trade mark infringements. As such, the book considers approaches adopted in some of the continental European countries and the US in order to propose reforms aimed at addressing gaps in the existing legal framework. This book also examines alternative remedies, such as notice and takedown and injunctions, and discusses the associated shortcomings of each of these remedies. Althaf Marsoof is an Assistant Professor at the Nanyang Business School, Nanyang Technological University, Singapore.